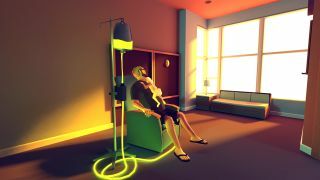 That Dragon, Cancer is a tribute to and remembrance of Joel Green, who was diagnosed with terminal cancer at 12 months of age and, despite being given just a few months to live, died in March 2014 at age five. His parents, Ryan and Amy, came up with the idea when Joel was four and successfully Kickstarted it at the end of 2014, and today announced that it will be released on January 12, 2016, which would have been Joel's seventh birthday. The game will obviously be intensely personal and emotional, but the announcement of the launch date is almost inspirationally playful. "Since it is Joel’s birthday, we wanted to do something Joel would have enjoyed to celebrate the launch. We want to have a worldwide pancake party on January 12th. (Joel loved pancakes and waffles!)" the developers wrote in the latest Kickstarter update. "To join in on the fun, just eat pancakes or waffles for dinner with all the messiest, most delicious toppings you can find on January 12th and post some photos to social media with #ThatDragonCancer." "We would love to hear about the people in your lives who have faced down their own dragons. What do you remember most fondly about them? What makes you laugh? What makes you miss them the most? If they are still with us, how do they inspire you? What are your favorite things to do together? We’ll re-tweet and share as many of your photos and stories as possible. If you really want to celebrate in style, invite some friends and family over for pancakes and make a party of it! We want to inspire you to speak out and talk about the loves and losses of the souls who changed you and made you who you are today." The trailer isn't easy to watch and I have no doubt that the game will be a difficult experience. But it also promises to be memorable and moving testament to the impact of Joel's all-too-short life, and to the courage and resilience of his parents and others who loved and cared for him. Find out more about That Dragon, Cancer at thatdragoncancer.com.